Just because you sold an item doesn’t mean that you have to head to the post office to ship your package. Thanks to technology and the new print-it-yourself postage, you can give all your packages directly to your mail carrier. You can print postage for First Class, Priority, Express, and Parcel Post, and additional postage for delivery confirmation and insurance. If your printer mangles a sheet of labels or an envelope, you can send the printed piece to your Internet postage provider for a refund. When you install your Internet postage software, you apply for a USPS postal license that allows you to print your own Information Based Indicia (IBI) for your postage. IBI is a bar code printed either on labels or directly on an envelope and has both human- and machine-readable information about where it was printed and security-related elements. IBI provides you, and the post office, with a much more secure way of getting your valuable packages through the mail. Several vendors of Internet-based postage exist, but Endicia Internet Postage and Stamps.com are the most popular. DAZzle — combined with the patented Dial-A-Zip — became the basis for the software that comes free with the Endicia Internet Postage service. 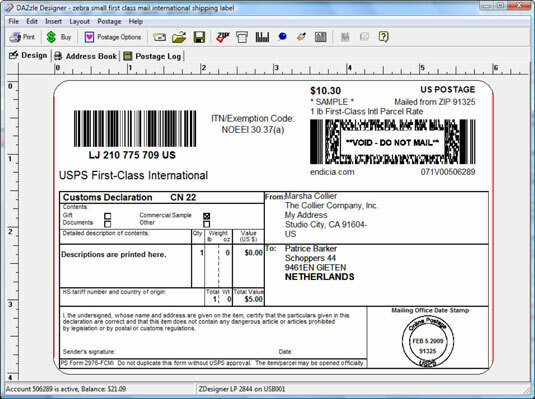 Prints postage for all classes of mail, including international: From Anniston, Alabama, to Bulawayo, Zimbabwe, the DAZzle software not only prints postage but also lists all your shipping options and applicable rates. For international mailing, Endicia advises you about any prohibitions (no prison-made goods can be mailed to Botswana), any restrictions, any necessary customs forms, and areas served within the country. Provides free delivery confirmation on Priority Mail: You can print electronic delivery confirmations for First Class, Parcel Post, and Media Mail for only $0.18 each (a substantial savings of from the Postal Service counter purchase). Enables you to design mail pieces: The software enables you to design envelopes, postcards, and labels with color graphics, logos, and text messages. You can print your labels with postage and delivery confirmation on anything from plain paper (tape it on with clear tape) to 4-by-6 labels in a label printer. Integrates with U-PIC private insurance: If you’re saving time and money using a private package insurer, you can send your monthly insurance logs electronically to U-PIC at the end of the month. Endicia offers two levels of service. All the preceding features come with the standard plan for $9.95 a month. The premium plan adds special features, customizable e-mail, enhanced online transaction reports and statistics, business reply mail, return shipping labels (prepaid so your customers won’t have to pay for the returns), and stealth indicia for $15.95 a month. For a free 60-day trial (30 days longer than offered to anyone else), go to Endicia. Stealth indicia (also known as postage-paid indicia) can be an awesome tool for the eBay seller. By using this feature, your customers can’t see the exact amount of postage that you paid for the package. This way, you can add reasonable shipping and handling costs and not inflame buyers when they see the final label.